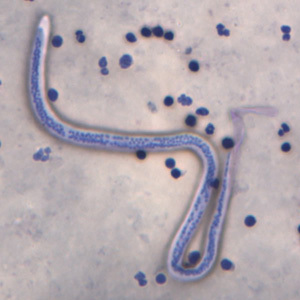 Wuchereria bancrofti is a species roundworms which can parasitise humans. They are normally transmitted to humans by mosquito. They infect the human lymphatic system and can cause several complications including the condition known as elephantitis in which the limbs swell up and become severely disfigured. At various stages in history the parasite could be found across most of the human inhabited world, however today it can only be found in third world countries.